For the second time in the last 20 years, many Americans called into question the use of the Electoral College, our system for electing a new president. In 2000, George W. Bush beat Al Gore in the Electoral College but lost the popular vote by more than half a million votes. A similar scenario occurred last year, when Hillary Clinton won the plurality of votes but lost the Electoral College to Donald Trump. Those seeking to abolish the Electoral College demand a system that more accurately reflects the premise of “one person, one vote” (i.e. a popular vote), while supporters of the Electoral College claim the system ensures that politicians campaign in rural “flyover” states and listen to the voices of all Americans. What neither side talks about is just how arbitrary the Electoral College is, how it hurts many rural states, and means that a vote in one state can have up to four times the weight of a vote in another. One assumption most people make about the Electoral College is that smaller states get a boost in terms of popular vote share. This trend is generally true; there are more votes per electoral vote in larger states than smaller states, effectively weighing smaller state’s votes as more significant. But don’t tell that to Idaho, which, despite being one of the least popular states, had twice as many actual votes per Electoral College vote as neighboring Wyoming. In other words, while nearly three times as many people in Idaho cast a vote for president than in Wyoming, all of those votes contributed to just one more Electoral College vote. A similar situation occurred in Montana, where nearly twice as many people voted as in Wyoming for the same three Electoral votes. Don’t worry, Wyoming lovers, we’ll pick on many other states later on. All three of these states are considered rural, conservative, with an overwhelming majority voting for Trump, and off the beaten path (Trump made one visit to Montana and Clinton made no visits) (Travel Tracker). All things equal, if the Electoral College were weighted in favor of rural states, shouldn’t all three of these states have a similar level of voting power? Perhaps, but that can’t happen with the Electoral College. No matter how few people live or vote in Wyoming, it will always get three electoral votes. With roughly double the population, Idaho got a second congressional seat in 2010 (the census year), but that only increases its influence in the Electoral College by 25%. Meanwhile, because electoral votes are given out in whole numbers, Montana suffered from not having enough people for another congressional seat. Rhode Island, which had about 10,000 more people than Montana as of 2016, got that extra congressional seat (and electoral vote). Despite more people voting in Montana than Rhode Island in 2016, Rhode Island voters had considerably more influence. So much for the Electoral College helping rural flyover states. This Rhode Island-Montana example touches on another issue with the Electoral College that is never talked about but should be: states having more people vote in an election than another state with more electoral votes. There are loads of examples from 2016 that impact states big and small alike. Loads of them. Fifteen states had at least one less electoral vote than another state that had fewer people vote in the 2016 Election. For instance, every state with 10 electoral votes (Maryland, Missouri, Minnesota, and Wisconsin) had more people vote than Tennessee, Arizona, and Indiana, all of which had 11 votes. Colorado, a state with only 9 electoral votes, had more people vote than those same three states. It’s worth noting that Arizona became a swing state (and has seen a population boom since the 2010 census) and Indiana had a close senate race, but they still had low voter turnout. On the other hand, Maryland had no races with less than a double-digit victory. The most egregious case of a state having more people vote in an election than another state with more electoral votes is Florida and Texas. Nobody votes in Texas. It had the second lowest voter turnout of its voting-age population, behind Hawaii. Texas received 38 electoral votes, while the third largest state, Florida, received 28. 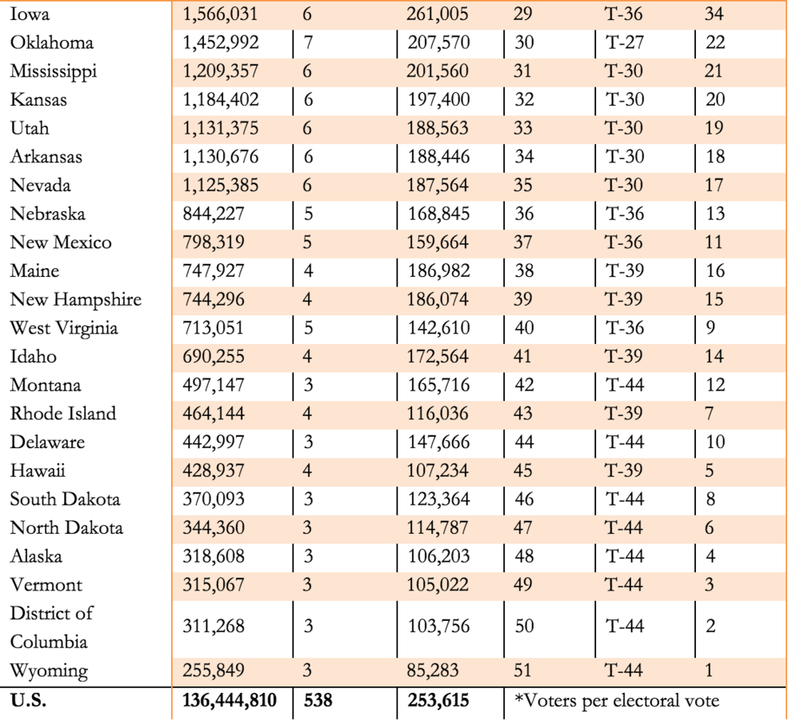 But despite having 9 more electoral votes than Florida, voter turnout was almost half a million people higher in the Sunshine state (see table, below). This demonstrates more than anything just how arbitrary the Electoral College is. You might be surprised to find the states with the weakest voting power in the past election were Florida, North Carolina, and Colorado. In 2012, the three states with the most diluted voting power were Ohio, Wisconsin, and North Carolina. These don’t really sound like the urban, coastal elite states we all thought the Electoral College harmed. Three went for Republicans; three went for Democrats. On the other hand, Wyoming, D.C., and Vermont had the strongest voting power in both the 2012 and 2016 elections (Democrats won 2 of these both times). These three regions have virtually nothing in common except from benefitting from the Electoral College. Voters in Wyoming that had roughly 4 times the voting power of Florida in the 2016 Election. Many will say, “So what? A lot of this has to do with how competitive a state is—influencing how many people show up to the polls and distorting voter power.” Well, perhaps we should have a system that rewards states that have high voter turnout (or, on the contrary, a mischievous system that punishes states with low voter turnout). This doesn’t necessarily mean going to a direct popular vote, but it does mean eliminating pre-determined weighting of state votes. That way, states are rewarded with increased influence for getting people to vote. This could also address voter suppression, but that’s another story. Wouldn’t that mean creating a system where candidates only have to campaign in big cities? And wouldn’t that favor democrats? No, and probably no. There’s still millions of Americans that live in rural areas and states. Changing the system would help states like Ohio, Wisconsin, North Carolina, and Florida, all of which Trump won. And, believe it or not, Barack Obama benefitted from the Electoral College in both of his wins. The Electoral College has more problems than many of its critics believe. It hurts voters in swing states, populous states, and any state that didn’t have just enough people at the time of the census to warrant an extra congressional seat. It’s arbitrary, hurts random states, and is the textbook definition of unfair.